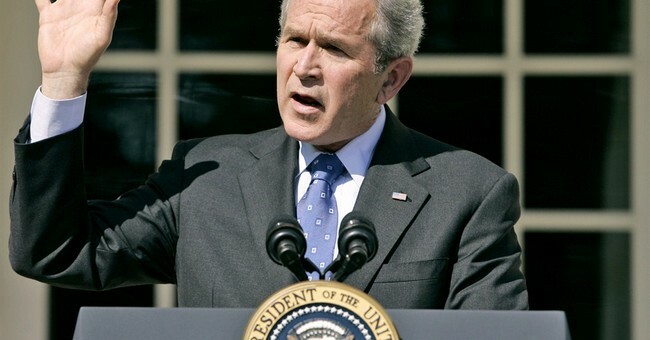 More than a decade after failing to secure America's border during his time in office, President George W. Bush is now calling for compromise to bring an end to the current government shutdown due to debate over the proper wall funding needed to end what President Donald J. Trump has deemed a "humanitarian crisis". The 43rd president of the United States made his plea via Instagram in a post showing himself delivering pizza to Secret Service members who have been without pay during the government shutdown. On Friday afternoon, President Bush posted a picture featuring former First Lady Laura Bush and a team of Secret Service agents, saying, "@LauraWBush and I are grateful to our Secret Service personnel and the thousands of Federal employees who are working hard for our country without a paycheck. And we thank our fellow citizens who are supporting them. It’s time for leaders on both sides to put politics aside, come together, and end this shutdown." On May 15, 2006, during a speech specifically about illegal immigration, President Bush said that "..the United States must secure its borders. This is a basic responsibility of a sovereign nation. It is also an urgent requirement of our national security. Our objective is straightforward: The border should be open to trade and lawful immigration, and shut to illegal immigrants, as well as criminals, drug dealers, and terrorists." One could make the argument that if President Bush had simply completed the promise he made to end illegal immigration then we would not be having this government shut down right now, let alone a President Trump. This call to action, of course, did not result in an end to illegal immigration which has now forced President Trump to negotiate so heavy-handedly with Democrats in Congress who refuse to supply funding for the wall. While President Bush brings an important and overlooked fact to light -- hundreds of Americans in the secret service, law enforcement, and other heroes without pay during this time -- it is curious he does not call upon Democratic leaders to agree to the necessary funding needed to help accomplish a goal he once sought during his time in office; a secure border.